You are currently browsing the archives for the The popping bubble category. Can they fly? I agree with Jake Dobkin — the numbers are way off. The wrong way. Excel dude is smoking his own VC-focused PPT. We’ve got another trillion or so to borrow in the next year — who we gonna call? Only 10% of tweeters really use the medium, says the Harvard study that served as the source for the BBC’s story. Wow, “broadcast” is a serious indictment, coming from the Beeb and Harvard, two pre-eminent institutions of bombastic broadcast! This Twitter backlash reminds me of the blog-bashing of 2001 and 2002, when journalists and academics were eager to “burst the blogging bubble” by identifying shortfalls, overreaches or variations from whatever standard of decency or probity they wanted it to live up to. What is it about blogs that so confuses and concerns newspaper columnists? I think most columnists lack the experiences and conceptual categories to understand “the blog.” Like a one-year-old baby grappling with the idea of other beings, the average newspaperman scribbling about bloggers can describe “the other” only as an ersatz version of himself. In essence, the bashers complain that blogs don’t measure up to “real” media. The Boston Globe’s recent column “In the world of Web logs, talk is cheap” regurgitates the list of complaints. Individual blogs don’t appeal to a broad audience. They aren’t serious or objective or edited. They contain meaningless personal details. They can be trite, verbose, incoherent and/or self-aggrandizing. We all know that none of these traits apply to newspaper columns, ergo, blogs must be bad. In fact, many blogs are so bad, Globe columnist Alex Beam concluded, that the most they can aspire to is being “mocked in a medium that people actually read,” ie the newspaper. The weblog community has pummeled Beam, and blogging dean Glenn Reynolds does the best job of logging the individual punches. Also, don’t miss pre-publication e-mail exchanges between Beam and Virginia Postrel and James Lileks. Here’s my own reaction to Beam and anyone else trying to understand blogs: measuring the blog against the newspaper is a waste of time. For a start, let’s try measuring the blog against other media, ancient and modern. Blogs compare rather well to an older and more widely used communications tool, talking. Anyone who complains about blogging as sloppy or fruitless might want to take a tape recorder along the next evening out with friends. The next morning, listen to the incoherence, grunting and mumbling that passes for scintillating communication. Not a fair test? As any newspaper reporter can tell you, even the most practiced, coherent and committed spokespeople rewind, elipsize and armwave their way through most points. Most human verbal communication isn’t rocket science… it’s sloppy, looping, incoherent, and prolix… which is part of its appeal. Sociability was frequently dismissed as idle gossip, and especially in the early days of the telephone, was actively discouraged. For example, a 1909 study of telephone service commissioned by the city of Chicago advocated measured rate service as a way to reduce “useless calls.” Yet the most successful communication technologies, the mail and the telephone, reached their full potential only when they embraced sociability and those “useless calls” as their goal. So forget about dissing blogs as chit chat. Forget about blasting blogs for unnewspaperness. The new order isn’t just a negation of the old, or a recombination of its components: the new media spawns new features and experiences which are indescribable in the old language. E-mail isn’t just “electronic mail,” it is bccing, subject lines, limitless dribble, forwarded jokes, FLAMING, writing a quick note when you don’t have the energy to engage in a full dialog, sig files. SMS is far more than “short messages sent by mobile telephone,” it’s a whole culture of instant feedback, global simultaneity, crooked thumbs, endorphined beeps announcing news and stimulation. In the same way, blogging isn’t a diary, a reading log, a common place book, a collection of newspaper articles or opinion columns. But what is it? Rather than asking how blogs fail, let’s enumerate what blogs do right. Let’s describe why they inspire so much passion. 500,000 bloggers can’t just be vain, right? In February, I listed timeliness, willingness to credit others, passion, blogrolling, human interest, chronology, and devotion as the characteristics that make blogs so appealing and useful for readers. But a blog’s power comes also from its benefits to the blogger. Blogs are a great tool for brainstorming and sharing knowledge. Blogs encourage us to write and think more clearly. Blogs force us to interact (intellectually and physically) with the texts we are reading. Blogs invite others to reward our creative effort with feedback and, sometimes, appreciation. Blogs weave new social networks, introducing us to people with common passions. Blogs disseminate “micro-opinions” that are important for a small audience but would never make it onto a newspaper’s op-ed or letters page. Blogs build a shared history of experience and opinion among friends and acquaintances. Talk is cheap and so is blogging, which is what makes both such powerful social tools. Blogging confers the bonus benefits of searchability, and temporal and spacial scalability. But enough comparisons and descriptions. The joy of tennis can’t be described, it must be played. And so it goes with Twitter. There’s some strange new social experience being born amidst the @s and RTs and #s and bit.lyed URLs. Spending time grunting about Twitter’s shortfalls — only 10% really use it and most people are passive misses out on the amazing social experience some of us ARE having. If you want to learn what makes Twitter special, don’t look at the 9 million low-tweeters, looks at the 1 million people who love it and are helping to invent some new social codes. Even if Tweets are not a true conversation, there’s something new going on in the vocabulary of @ and # and “d” messages betwixt and between folks. It will take us a long time to figure out exactly what and give it a name. But it won’t be along metrics defined (developed) by existing media. And folks who sit on the sidelines, fingers firmly in their ears and complain “this new stuff isn’t as good at what WE do” are missing the point entirely. First quarter ad sales were off 5% versus Q1 ’08, the IAB estimates. This is the first year-over-year decline in quarterly Internet advertising since 2002. Versus the holiday-bloated Q4, the Q1 number was an even more horrendous decline, down 17%. Relative to the rest of the economy, the Internet advertising decline doesn’t look outrageous. But the rest of the economy isn’t still pumping out product — more cars, more hotdogs, more washingmachines, more homes — with reckless abandon. Producers have cut back to reduce costs and avoid stockpiling goods nobody will buy. The same isn’t true online. New dotcoms are still being conceived and birthed daily, and CGM (postings on Youtube, Myspace, Flickr etc) is still doubling yearly. TheStreet.com Inc.(TSCM Quote), an online financial media company and the publisher of this Web site, swung to a loss in the fiscal first quarter and said revenue declined 26% from the same period a year ago. For the first quarter ended March 31, total revenue was $14 million, down from $18.9 million in the same quarter of 2008. Does anyone know of a “publisher dead pool” that we can link to? Ad spending off 9% in Q4? Emily Steele reports:In a sign that marketers have begun to deepen their cutbacks, TNS Media Intelligence, an ad-tracking firm owned by WPP PLC, reported Monday that ad spending in the fourth quarter fell 9.2% from a year earlier.That’s a lot worse than any numbers we’ve heard yet elsewhere. The newspaper division reported an operating loss of $53.8 million caused by steep fall-offs in advertising, which are being felt across the industry. Print advertising revenue at The Post plummeted 33 percent in the first three months of this year, compared to the same period last year, and revenue at The Post’s online properties — chiefly, Washingtonpost.com — dropped 8 percent in the quarter, the first decline in ad revenue at the online unit in recent memory. On a recent trip to New York, we stopped through Brooks Brothers on 44th and Madison, where I bought suits while I worked on Wall Street in the 80s. Brooks Brothers, once Wall Street’s bustling official dressing room, was a silk-strewn and worsted-wool-festooned desert. Of course, two seconds of thinking made it obvious that no sane banker is today spending $80 on a hank of silk to wrap around his neck when in doubt about his job prospects. A simple rope will do. And who wants to spend $1600 on a suit, below, and then find himself only wearing said suit to Starbucks to sip coffee and browse TheLadders? A track suit will suffice. 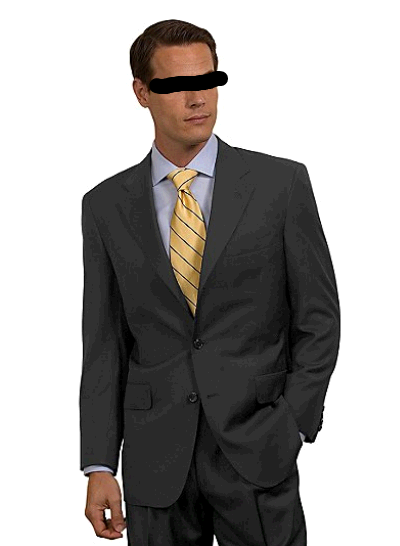 Suits are useless as anything other than social devices traditionally deployed to signal that the wearer is not a manual laborer, that the wearer is a cut or three above the hoi polloi. White collar and all that, don’t ya know. But now, of course, a suit is worn predominantly by folks who made a bunch of lousy bets with other people’s money or who are now living large on the public dole. When the economy comes back, will the suit return too? Not if banking loses its aura as an esteemed dynamo of capitalist innovation. You don’t find a soul wearing a suit at SXSW, where the creative class — programmers, designers, writers and ad execs — gather to hobnob every March. Suits may soon the way of the top hat, the cummerbund and 3% ten year US T-notes.